ACTION ALERT! 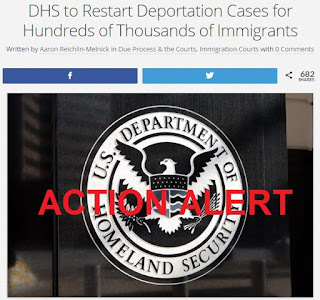 WE MUST STOP DHS AND DOJ FROM EXECUTING CRIMES AGAINST HUMANITY! The U.S. Gov't has become unhinged! If you are reading this, you should be extremely concerned. This administration is separating and devasting families and communities at unprecedented rates. Whether you like it or not, let's call it what it is, "white-collar ethnic cleansing," right here on U.S. soil. The United States Government is guilty of committing crimes against humanity. This is tantamount to emotional terrorism perpetrated by the nation's government. We must NOT accept this. Policies must change to become more human-centered. Immigration must be removed from the controls of DOJ and realigned with the judicial branch of government. Judges must be given judicial discretion and the ability to preside over every case fairly. They must not become administrative rubber-stampers for this administration's efforts to rid the nation of non-white immigrants. All human beings in this nation share one constitutional right - the right to due process. Even the undocumented in our community are afforded this right. This administration has completely removed our immigration judges abilities to oversee that justice is adhered to on a case-by-case basis and that these cases will be heard. This is systematic ethnic cleansing like never before seen! We MUST NOT allow this to continue. Take Action!!! Join us in our fight! ACTION ALERT! - Together We Must Fight! We are standing up! We are fighting the insane policies of this government. We need your support! We seek to stop the deportation of my husband, Luis Enrique Gonzalez Ortiz and uphold my constitutional rights to be married and with my husband in the United States of America. Please sign our petition here!